Many will recall that there was a company called Tungsten Super Shot that eventually closed its doors. Tungsten Super Shot is the densest shot material on the planet at 18 grams per cc. This is a significant density increase from what was the densest factory loaded shot, Federal's Heavyweight which is about 15 g/cc. What the additional density allows a pellet to do is nothing shot of astounding. If you want 1.75 inches of penetration, #2 steel is out of gas at about 38 yards. With #5 lead, the limit is about 52 yards. Federal's new TSS loads in #7 shot maintain 1.75 inches of penetration to 100 yards. The TSS load shown in the chart is a 20 gauge load. 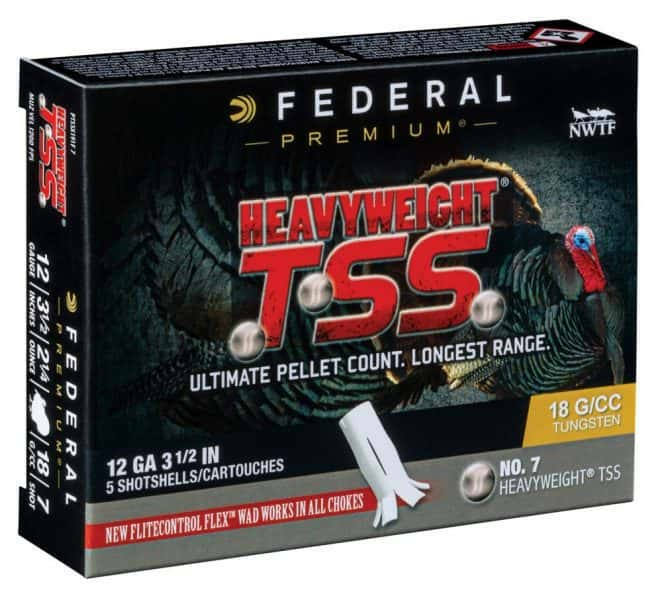 Federal's testing shows that a 3-inch 12-gauge load with 1 3/4 ounces of #7 TSS shot nets 200 hits in a 10-inch circle at 40 yards, and #9 TSS shot nets about 350 hits. Trulock Choke Company has been working with these loads for some time. Federal is launching a full line of these loads in 12 gauge, 20 gauge, and .410 bore, in both #9 and #7 shot sizes. These loads feature the improved Flite Control Wad that Federal introduced last year in some of their Black Cloud loads, designated as the “FliteControl Flex Wad.” I'm talking about this with Federal here: https://youtu.be/1PMRjPyryM4 . TSS has long been a favorite of some handloaders. 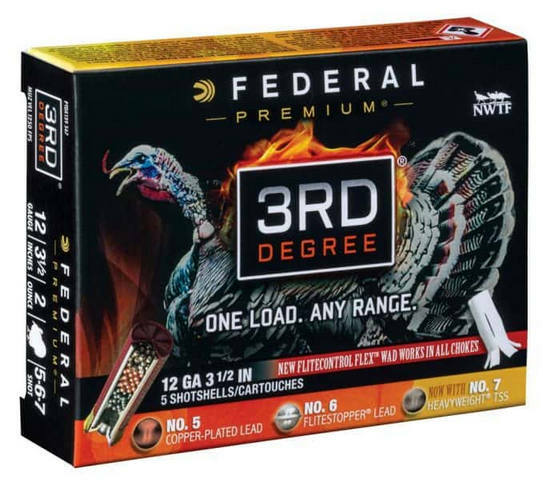 Now Federal makes it a factory, production item and they will easily be the longest range factory turkey loads ever offered in the history of the world. They are made not just with the improved wad, but also with buffering and roll crimps. Federal plans on having them available for the 2018 turkey season. 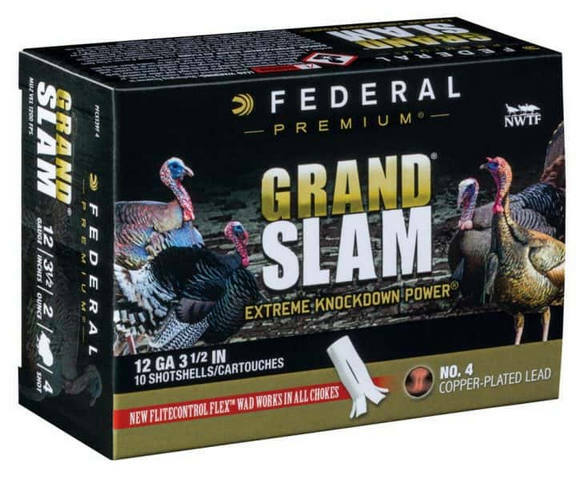 The most affordable of the Federal turkey line-up are the buffered lead Grand Slam loads, followed by the very good 3RD Degree line which has some Heavyweight #7 pellets, and finally the ultra-high performance Heavyweight TSS. Here's a 50 yard exterior ballistics comparison (1-1/2 oz. payloads) between Federal Heavyweight #7, Lead #5, Federal TSS #7, and Federal TSS #9. TSS #7 is spectacularly devastating, handily outperforming #2 lead and even edging out #1 lead at 50 yards.